Our group uses state of the art computer models to study the role chemical species have on our atmosphere. We use CTM's (p-TOMCAT) and GCM's (Unified Model & UKCA). The group in the Chemistry Department has a very active research program into all aspects of atmospheric chemistry. 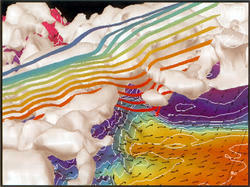 There a modelling studies of stratospheric and tropospheric chemistry, using 1D, 2D and 3D models. The group also builds its own instruments for observations of chemical constituents in the atmosphere. Peter Haynes' research focusses on the large-scale fluid dynamics of atmosphere and ocean, and related topics, particularly in climate science. In fluid dynamics he is interested in wave propagation and breaking and its implication for the background flow, and in transport and mixing of trace species, including reacting chemical and biological species. These topics are relevant to both atmosphere and ocean. In atmospheric science, he is interested in the dynamics of the global circulation, in interactions between dynamics, chemistry and radiation, and in the various physical and dynamical processes controlling the distributions of chemical species, including water vapour.